Third baseman Eric Chavez has retired, effective immediately, according to Jon Heyman of CBS Sports (Twitter link). The 36-year-old has seen time in 17 MLB seasons. Chavez hit .246/.346/.449 in 81 plate appearances for the Diamondbacks this season, but hasn’t played since early June due to injury. He’s battled knee trouble this season and also has a long history of back issues. Of course, his best seasons came earlier in his career with the Athletics, when Chavez was among the game’s more productive players. Over the 2000-2006 time frame, Chavez compiled a .273/.352/.495 slash with 199 home runs. With outstanding defense, he was worth 31 rWAR and 31.1 fWAR during that stretch. From that point forward, Chavez was limited by injuries, and never saw more than 400 trips to the plate in a season. But he remained a productive reserve, ultimately moving to the Yankees and then Diamondbacks. It was no coincidence that the “Moneyball” Athletics made five postseason appearances in the time that Chavez was at his peak. Though he never quite delivered full value on a six-year, $66MM extension signed before the 2004 campaign, Chavez nevertheless was, in the aggregate, a cheap source of top-level production for Oakland after being taken 10th overall in the 1996 draft. 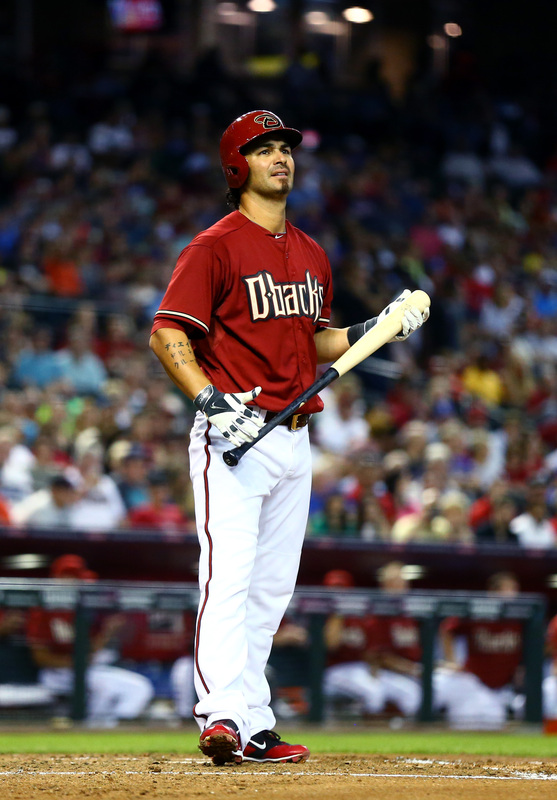 Eric Chavez will officially be returning to the Diamondbacks for a second season. The team announced today that it has signed the third baseman to a one-year contract. Chavez, a client of All Bases Covered, is reportedly guaranteed $3.5MM and can earn another $1MM via incentives. He will receive $250K for playing in 60, 90, 120 and 150 games. Chavez batted .281/.341/.488 with 25 homers in 567 plate appearances over the past two seasons between the Diamondbacks and Yankees. Once considered a defensive wizard at the hot corner, Chavez's glove-work has declined in recent years after a slew of back, shoulder and neck injuries have taken their toll on the veteran's body. The 36-year-old veteran figures to serve as a left-handed bat off the bench and can back up regular third baseman Martin Prado from time to time. Chavez also has experience at first base, so he could see some time there should Paul Goldschmidt be injured or require a day off (though Mark Trumbo could back up that position as well). Chavez was also connected to the Yankees and Braves this offseason. In the end, Jon Heyman of CBS Sports reports (via Twitter) that he preferred to stay close to his Phoenix home. Heyman of CBS Sports was the first to report the agreement and the terms of the contract (Twitter links). Ken Rosenthal of FOX Sports reported the incentives structure (also on Twitter). Former Twins reliever Juan Rincon is looking for a minor league deal with, ideally, an invite to big league spring training, agent Burton Rocks tells MLBTR. Rincon, 35 in January, wants a club to bring him in to help mentor younger pitchers and have him continue in that role after his playing career is through as a scout. Rocks has talked to "four or five" clubs about his unique proposal for Rincon, who spent last season with the York Revolution of the Atlantic League. The White Sox have an infusion of young, exciting position players including outfielders Avisail Garcia and Adam Eaton and Paul Konerko is excited to be back in the fold and see what they can do. "Eaton is the guy that can make things go if he hits his stride," Konerko said on a conference call with White Sox season ticket holders, according to CSNChicago.com. "A guy like Eaton can be a someone who is a complete steal because of the tools he has. He can be a real mainstay." Konerko re-signed with Chicago on a one-year deal that gives him a $2.5MM guarantee. Dayan Viciedo could split time this season with Alejandro De Aza in left field, remain the starter if De Aza is moved, or he could wind up traded himself, writes CSNChicago.com's Dan Hayes. The White Sox haven't given up on the 25-year-old, but they're not sure what they'll do with him either. Jeff Karstens is said to be pain-free and in midst of normal winter throwing program. tweets Jon Heyman of CBSSports.com. He's planning to work out for clubs in January. Karstens had shoulder surgery in June, which involved debridement of his rotator cuff and labrum, and never threw a big league pitch for the Pirates in 2013. The veteran is represented by All Bases Covered Sports Management, as shown in the MLBTR Agency Database. The Twins were in on Eric Chavez before he signed with the Diamondbacks earlier today, a source tells Darren Wolfson of 1500 ESPN (via Twitter). With Corey Hart and Logan Morrison heading to the Mariners and James Loney agreeing to return to the Rays this week, the Pirates and Brewers remain on the hunt for a first baseman, as MLB.com's Anthony DiComo notes (via Twitter). The Astros could be on the lookout for a first baseman as well. With Mike Napoli (Red Sox) and Justin Morneau (Rockies) also gone, there isn't much left on the free-agent market, which means teams still hoping to acquire a first baseman will probably also consider trades. Here's a look at the main options still available. Matt Adams, Cardinals. Adams is far better than most of the players listed below, but the Cardinals would only be likely to move him in a major deal. It would be very hard for the Pirates or Brewers to pry him away, since they're both NL Central teams, and the Astros likely don't have the big-league talent the Cardinals would need in order to decide to part with him. His .284/.335/.503 line in 2013 would be a valuable addition to any big-league lineup, however. Kendrys Morales, free agent. Morales might be the highest-profile name remaining as a free agent, but after a season in which he hit .277/.336/.449 while playing poor defense (in the 31 games in which he played first base), he declined the Mariners' qualifying offer. It's hard to see many teams, including the Pirates and Brewers, give up a draft pick for the right to sign a defensively-limited player on the wrong side of 30. It appears likely that Morales will end up back with an AL team, as CBS Sports' Mike Axisa recently noted. Ike Davis, Mets. The Mets seem determined to trade either Davis or Lucas Duda. Davis may be the more attractive of the two candidates, due to his power, although he'll also be more expensive than Duda in arbitration this year. The Mets also seem more inclined to trade Davis. With Loney off the market, there's now a clear path for the Mets to deal Davis to either the Brewers or Pirates. There may be a feeling around baseball that they waited too long, however, with Mike Puma of the New York Post recently tweeting that a source recently told him the Mets were going to "sell low" on Davis. The Star-Ledger's Andy McCullough, meanwhile, tweeted, "The Mets' slow, steady march toward trading Ike Davis for something like a right-handed relief prospect is such a drag." In any case, it's hard to see the Mets getting much for Davis, or any team getting particularly excited about installing him at first, after he hit .205/.326/.334 in 2013, even though he batted .286/.449/.505 after the All-Star break. Davis appears set to make about $3.5MM through arbitration in 2014. Justin Smoak, Mariners. With Hart and Morrison both heading to Seattle, Smoak is now available, with the Mariners likely favoring a big-league contributor, rather than a prospect, in return. It remains to be seen how much other teams might want Smoak, however — the former top prospect has hovered around replacement level for his career, and at 27, it may be that his once-highly-regarded bat won't ever carry him. Smoak hit .238/.334/.412 in 2013. Mitch Moreland, Rangers. Moreland's name has appeared in trade rumors since Texas traded for Prince Fielder, but he currently still has a role in Texas at DH. That could change somewhat, however, if the Rangers sign Shin-Soo Choo or re-sign Nelson Cruz, but right now, there appears to be no pressing reason for the Rangers to trade Moreland unless they want to. Moreland hit .232/.299/.437 in 2013, but unlike any of the trade candidates mentioned above, he does play plus defense at first base. Adam Lind, Blue Jays. Lind, who batted .288/.357/.497 in 2013, is a well-above-average hitter, but he's not much of a defender at any position. Also, like Moreland, he has a clear role on his current team as a DH. The Pirates recently asked the Jays about Lind, only to have the Jays ask for Neil Walker in return. If the Blue Jays do trade Lind, he probably won't come cheap. Mike Carp, Red Sox. WEEI's Rob Bradford recently tweeted that Carp was receiving plenty of attention on the trade market, which is no surprise — unlike Davis and Smoak, Carp hit well in 2013, and unlike Moreland and Lind, he has no clear starting role with his current team. Carp played mostly first base and outfield in 2013, but with Jackie Bradley Jr. expected to replace Jacoby Ellsbury in center field, and with Shane Victorino, Daniel Nava and Jonny Gomes expected to play in the corner spots, he won't necessarily be needed in the outfield next year. There isn't much room elsewhere, either, with Mike Napoli and David Ortiz returning at first base and DH, respectively. If Carp hits .296/.362/.523 again, the Red Sox can surely find space for him, but if another team approaches them with a nice offer, they could easily deal him, too. Eric Chavez, free agent. CBS Sports' Jon Heyman recently reported that the Pirates were one of several teams to check in on Chavez, and upon inspection, it's easy to see why. The veteran hit .281/.332/.478 in Arizona in 2013, and while he has limited experience at first base and isn't the defensive star he once was at third, it's easy to imagine he would be at least average defensively if he were to move across the diamond. He might also be relatively cheap, since he was a part-time player in 2013. He's an injury risk, but with Pittsburgh, in particular, he wouldn't have to play every day, since Gaby Sanchez would start against lefties. Kevin Youkilis, free agent. Youkilis missed most of the 2013 season due to injury and wasn't good when he played, but he was a valuable asset as recently as 2011. He'll be 35 in March, however, and showed signs of decline in 2012, so it's fair to wonder how much he has left. He also prefers to play on the West Coast, so he may not want to sign with Milwaukee or Pittsburgh.